Wayne Community College recently was tapped to host troubleshooting training for a special group of General Motors technicians. 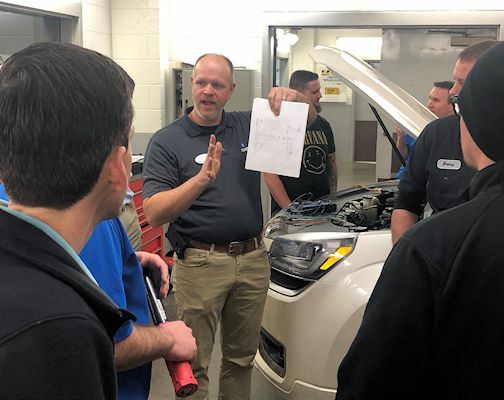 The college provided a “Sharpshooter Clinic” on data system diagnosis for 18 technicians from the Raleigh area and eastern North Carolina who were hand-picked by GM district management for the event. Such clinics that provide training on special topics such as in-depth diagnostic routines or emerging technologies have been conducted across the country but not in this state. David Bryd, a WCC automotive instructor, makes a point during General Motors Sharpshooter training. Bryd is the GM Automotive Service Educational Program Coordinator at the college. “This was the first time we have done this in NC. Our area’s GM Field Service Engineers (FSEs) approached me and asked if I could help them get it set up and use our facilities,” said WCC GM Automotive Service Educational Program (ASEP) Coordinator David Byrd. 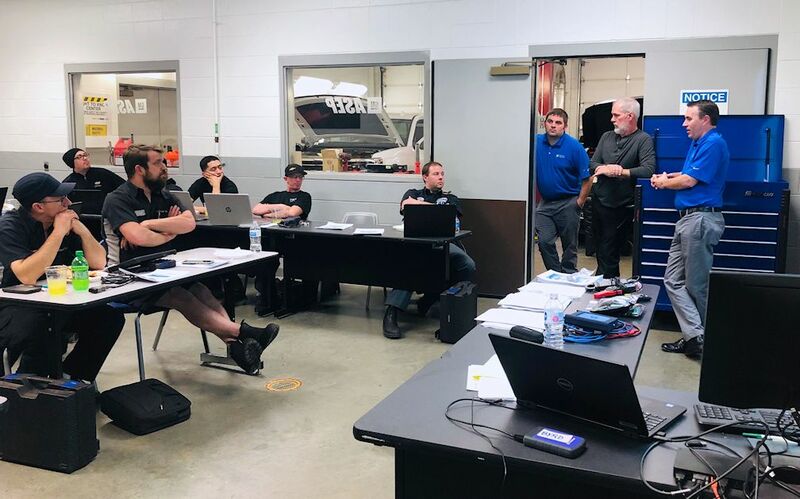 Byrd and fellow WCC Automotive Instructor Joseph Braswell, along with GM FSEs for North Carolina Steve Mohr and Jim Chirichello and Richmond, Virginia-area FSE Kevin Lockhart, led the clinic. General Motors Field Service Engineers Kevin Lockhart, Steve Mohr, and Jim Chirichello (right to left in doorway) speak to GM technicians in a special Troubleshooter Clinic held at the college. Their three-hour session was about special equipment such as a PicoScope Oscilloscope and GM software to demonstrate some of the diagnostic techniques that are normally not required “run of the mill” diagnostic situations, explained Byrd. “It was a big success and there has been some talk about doing it again with a different group of technicians,” Byrd said. Wayne Community College is one of 50 colleges across the country that has the GM ASEP program that prepares students to be GM Certified Service Technicians. In addition to automotive technical training and academics, students gain experience working with experienced technicians in GM dealerships. In addition to more than a dozen third-party certifications, students can earn an Automotive Systems Technology GM-ASEP associate in applied science degree.